Nearby, the Purple Dragons have purloined a wrecking crane from a construction site and they’re playing “game show” with it. Will they demolish Apartment #1 or Apartment #2? Unfortunately, they choose Apartment #1, which just happens to be April’s place. Knocking down the wall of her home, they immediately recognize her. They demand she fork over her stereo and when she refuses, they send the wrecking ball careening her way. Luckily, Raphael, Michelangelo and Donatello intervene, clobbering all the Purple Dragons. Leonardo grabs the cable of the crane and cuts it with his sword. Now off-target, the wrecking ball misses April, but takes the roof off her apartment. Terrified, the Purple Dragons flee. April tells the Turtles that she’s okay and the damage to her building looks worse than it is. The only problem is the lack of a roof… a problem which is exacerbated when it begins to rain. The Turtles tell her she can sleep in the sewers with them, nestled comfortably in a drainage valve. April is overjoyed. *The Turtle Force Fanclub Kit was available as a promotion attached to Playmates action figures beginning in 1988. The kit also included a sticker, membership card, certificate of authenticity, and a bandana. You also received a 12-month subscription to The Chaos Chronicle newsletter. The letter packaged with the kit welcoming new members was written by the fanclub president, “P.J. Van Egeren” (evidently a real person!). *The author/artist for this comic was not credited. *A similar fanclub kit would be released by AJN/Playmates in 1997, promoting the new Next Mutation line. It featured a fact booklet instead of a comic: The Green Pages. The Turtle Force Fanclub was something I never belonged to, though I would have sent away for a membership in a heartbeat. Kids are suckers like that. For a thorough rundown of the contents of the Fanclub Kit, check out this old X-Entertainment article. 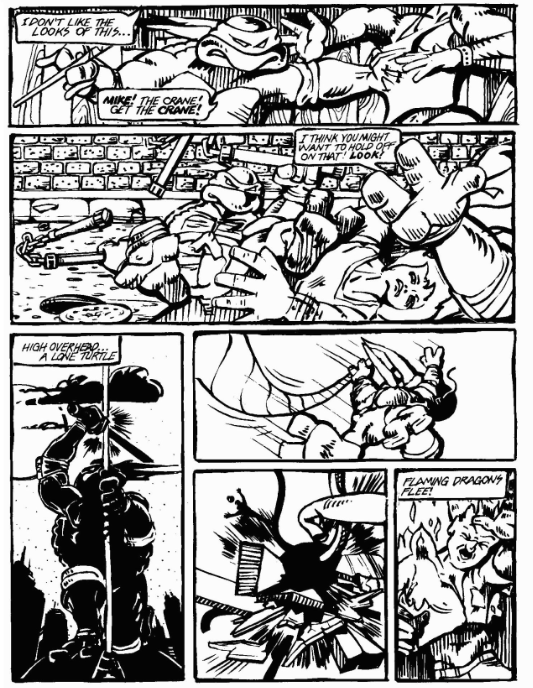 The story features a rare appearance from the Purple Dragons, who premiered in TMNT (Vol. 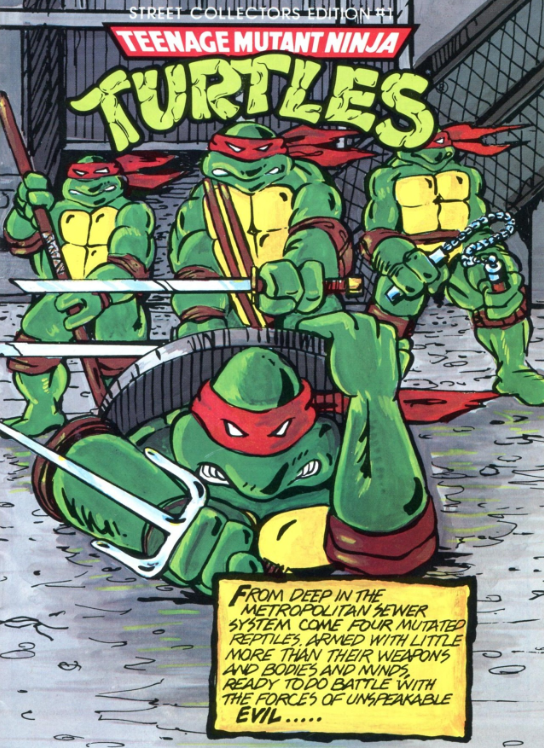 1) #1 and promptly vanished until they were revived for the 4Kids TMNT cartoon. This may be their only other appearance between 1984 and 2003, though I might be missing something. They kind of look similar. A little. The story’s pretty “meh” and whoever wrote it can’t decide if the gang is called the “Purple Dragons” or the “Flaming Dragons” between pages. The art is hard to decipher, too, especially considering how heavily inked the linework is (which wasn’t very coherent to begin with). 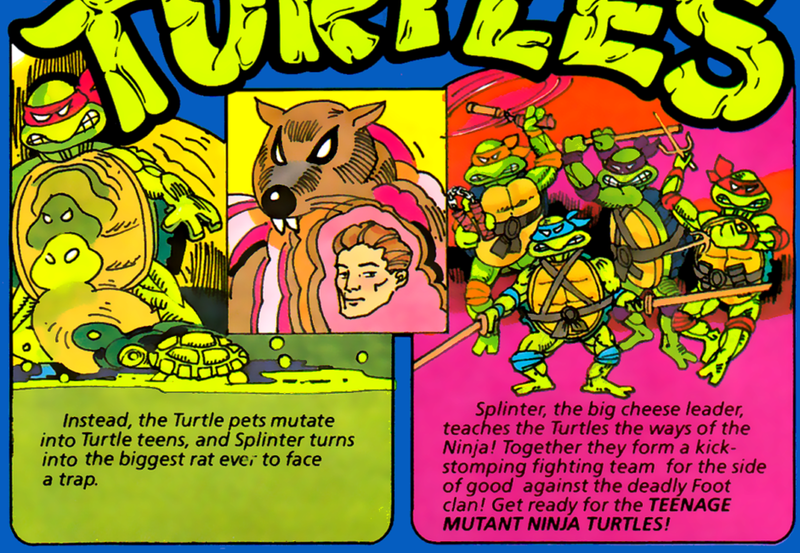 Still, this was a free incentive to join a TMNT fanclub in ’88 and I’m sure it thrilled its fair share of children. It appears that whoever the artist was, he/she was trying to emulate the original Mirage comics grittiness, which seems to be consistent with the early Playmates artwork for TMNT toys. They even have the red bandanas on the cover, and Leo's pose reminds me of artwork by Michael Dooney from around that time. You'll see Leo's and Don's poses appear to be directly taken from the Eastman piece. I'd glad you remembered this little booklet. It is an interesting stylistic mix falling somewhere between the Mirage and Fred Wolf cartoon tones. I never owned this one, but I really find it interesting for some reason. And I hadn't noticed how similar the artwork is to the origin comic on the back of the early box art. Nice catch! Hi! My name is Helen Van Egeren, and I recently stummbled across this website, and I thought I'd leave you a surprising message. I can confirm that this man P.J. Van Egeren exists, and that he was infact President, and finally that that is his signature. Just thought I'd tell you that, and did find it amusing that there was a blog post out there questioning my father's existence. I will take your word for it! Even without a birth certificate.